With the support of world class infrastructure, we are able to manufacture a comprehensive array of Acrylic Rotational Displays. We provide these dispensers in varied shapes and sizes, so as to cater to the diverse requirements of our clients. These have been widely appreciated in the market for their premium quality and attractiveness. 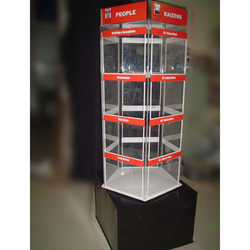 We are instrumental in the manufacturing and trading of optimum quality Acrylic Rotating Brochure Stand to the esteemed clients. These brochure stands are manufactured under the supervision of expert team in compliance with industry set norms and parameters. Offered stands are manufactured using quality tested raw materials and excellent quality craftsmanship. 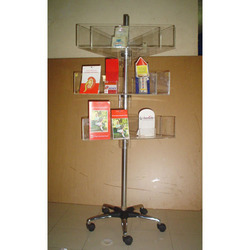 These stands are widely demanded in libraries, educational institutes, office receptions and show rooms. 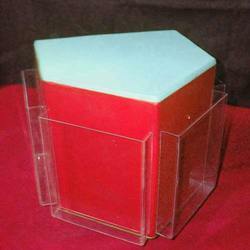 Our organization is among the leading names engaged in the manufacturing and supplying of premium quality Acrylic Hexagon Display. These stands are manufactured in accordance with industry set parameters using finest quality raw materials that are procured from well established vendors. Offered products are widely appreciated for their elegant design, fine finish, easy installation and optimum rotation. Owing to our domain expertise and knowledge, we are engaged in the manufacturing, supplying and trading of high quality Acrylic Display Stands. Obtained from authentic vendors, quality grade raw material is used in the manufacturing of offered charts. Appreciated for their durability, exclusive design and hassle-free rotation, these charts are ideal for domestic and commercial purposes. Our organization is instrumental in the manufacturing and supplying of premium quality Acrylic Rotating Book Display to the honored customers. These book display are manufactured under the supervision of qualified professionals with efficient workmanship. Known for their attractive design, fine finish, light weight and hassle-free rotation, these book stands are ideal for domestic and commercial use. Our organization is counted among the leading manufacturers and traders of high quality Acrylic Rotational Displays. These displays are manufactured in compliance with industry set norms and specifications under strict supervision. Offered displays are acknowledged by the clients for their glossy finish, eye-catching design and market leading prices.